An intergenerational music group that meets one Thursday in the month at 10.45 - 11.30am at Abingdon Court Care Home to provide interaction between the elderly residents and local toddlers. Please check our Facebook page for event dates, as these are subject to change. 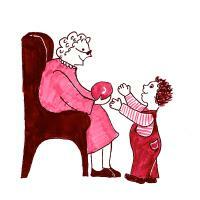 We sing traditional and new nursery rhymes and action songs to awake memories and to have an enjoyable time together. Families from Abingdon as well as residents' grandchildren and great grandchildren are very welcome. There is no charge and you do not have to book (although it would be very helpful if you could connect with us through our Facebook page). Please note: due to the vunerability of the residents, please do not attend if suffering from a bad cold, cough or sickness. opposite MacDonalds on the Marcham Road, there are a small number of parking spaces.